1. Preheat the oven to 200°C, gas mark 6. Slice the sweet potatoes into slender wedges, about 6-8 per potato. Transfer to a large roasting tin and toss with 2 tbsp oil. Dust with the paprika and season. Roast for 40-45 minutes, turning with a spatula halfway through. 2. Meanwhile, stir the garlic into the yogurt with ½ the chopped herbs and the lemon juice; season and set aside. Ten minutes before the potatoes are cooked, put the remaining 1 tbsp oil in a frying pan over a low-medium heat. Add the shallots and a pinch of salt and fry gently for 8 minutes, stirring often, until soft. Increase the heat slightly and add the capers, cooking for 1-2 minutes, until the shallots turn slightly golden. 3. 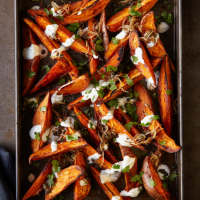 Arrange the sweet potatoes on a platter and spoon the yogurt dressing over, scattering with the shallots and capers, and the remaining herbs.